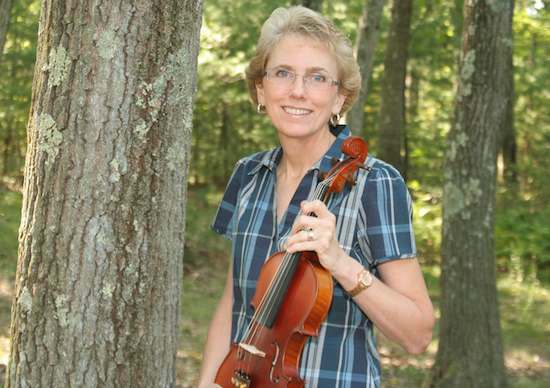 Meet "KindaScratchy" from Fiddlerman's "Fiddle Talk" forum | LEARN TO PLAY THE VIOLIN FOR FREE! • Please begin by telling us anything you would like to about yourself. Age, place of birth, residence, etc. My name is Diane. I just turned 50 in July. I was born and raised in Rhode Island, attended college in Boston, got a job in Boston after college and have lived in Massachusetts ever since. Now I work in western Massachusetts and live about 30 miles southwest of Boston, just north of the Rhode Island border. • What made you decide to play the violin? Well, I’ve always loved violin and fiddle music, and have played a number of other instruments over the years, but a seemingly unrelated sequence of events led to my taking up the violin. A number of years back I had occasion to travel to Shepherdstown, West Virginia a few times for work and discovered a place called O’Hurley’s General Store, which has a Thursday night jam session for local musicians who play guitars, fiddles, banjos, hammer dulcimers, harp, tin whistles, sometimes a bodhrán or Celtic drum. They play Appalachian folk music, Celtic music and the like. I enjoyed the O’Hurley’s jam session so much that when my husband and I planned a trip to see Civil War and Revolutionary War sites in area, we orchestrated our itinerary so that we’d pass through Shepherdstown on a Thursday. The last time we were there, which was last December, we really enjoyed one particular song called Eternal Friendship, which we found out later was recorded by Natalie MacMaster. I remarked at the time that I’d love to be able to play it on the violin someday. The seed of an idea was planted, albeit unintentionally. A few months later, my husband gave me my violin for Valentine’s Day. • How long have you been playing the violin? Almost seven months, since Valentine’s Day, 2012. • How often do you play? How long are your practice sessions? I try to play every day. I usually practice 30 to 45 minutes on week days and an hour or more on weekend days. • In your opinion, what’s your proficiency on the violin? Hmmm. Guess I’d say Intermediate Beginner, if there is such a thing. • Your greatest personal experience with playing? As far as the violin is concerned, my greatest experience is just getting the violin and realizing what a beautiful instrument it is, how much I love playing it. With music in general, I have many great memories associated with the different instruments that I’ve played over the years: playing the guitar around the campfire at summer camp, playing the flute with the high school band on a trip to Italy and playing the fife at historical events during the Bicentennial. • What other instruments do you play? My primary instrument is the guitar. I’ve played guitar since I was 11 years old. That doesn’t necessarily mean that I’m really good at it, but I’d say that I play well enough to entertain myself and occasionally other people. My first instrument was the recorder. Then I took up the guitar, and later the fife and the flute. I’ve also dabbled with the harmonica a bit. • What does music mean to you? Music has been an important part of my life at various times. It provided a way to make friends when I was a kid. As I got older, it’s mostly been a relaxing pastime. I have to admit that my interest in and the amount of time that I devoted to music had waned a bit, but I credit my husband for renewing my musical interest and enthusiasm, first by giving me a new guitar a couple of Christmases ago – a pretty Epiphone Hummingbird that ties in my love of hummingbirds – and my violin this year. • What or who has been your greatest influence? My family. • What are your goals for playing violin? Short and long. My short term goal is to be able to play without scratching, squeaking or whistling, and without hitting adjacent strings. My intermediate goal is to be able to play a few songs relatively well for others. My long term goal is to be able to play well enough to play in a group or jam session. • What type of violin training? I’m taking weekly private lessons at a local music shop. Plus, I’ve been viewing videos and using other instructional materials on fiddlerman.com. And, Fiddlerman’s group projects are serving as “stretch” projects that get me to try more advanced techniques. • How do you warm up? I start with scales, then I play a few tunes that I’ve memorized, just to shake off the cobwebs. Then I’ll get into exercises in my lesson book, and finally I’ll work on sheet music for a few songs that I’d like to play well. • What is your favorite type of music? I love anything acoustic, particularly if it includes guitar, fiddle or violin, banjo, mandolin, etc. I enjoy Celtic and Irish music, early American folk music, Colonial and Civil War era music, contemporary folk music, some Country music, bluegrass, and pop music that features acoustic instruments. • What is your favorite piece of music? Why? It’s hard to pick just one. For violin music, I love Eternal Friendship, as well as a few other pieces on Natalie MacMaster CDs, including Farewell to Peter and Johsefin’s Waltz. I really love the Schindler’s List Theme. There are some songs from movies that I enjoy like Edelweiss and Somewhere Over the Rainbow, and I’ve got a whole set of other favorites on the guitar. • What are your 2 favorite things to do other than playing violin? Travel and photography, which often go hand-in-hand. I also enjoy gardening and writing, but you only asked for two. • Do you come from a musical family? If so please tell us about them. Not so much, though my husband plays the keyboards and is learning to play the violin, too. • Are you a member of any orchestra? No, not ready for that yet. Maybe someday. • Do you ever perform publicly? Not yet. Unless you count the videos that I’ve posted on Fiddlerman.com and the Bile Em Cabbage Down project. The only people that I’ve ever played for in person are my husband, my teacher and my parents. • What do you work with? I’m a public affairs officer with a federal government agency. My job involves strategic communications planning, media relations, writing and editing, special event planning, photography, publication development, multimedia production, web publishing and social media. Although it’s primarily an office job, I’m fortunate that because of the nature of my agency’s work, I have many opportunities to get out from behind the computer and get outdoors to attend and shoot photos at events, field visits, etc. I also get to travel occasionally for work. • Would you please share with us information about your violin and bow and if you have several please tell us about them as well. My husband gave me my violin for Valentine’s Day this year. It’s not a brand name but I think it has very good sound, and my teacher confirms that. I also love the way it looks with its matte finish. I have two bows: the wooden bow that came with the violin and Fiddlerman’s carbon fiber bow. I use the CF bow most of the time and keep the other bow in my case, just in case I forget to pack the CF bow (yes, I’ve done that). I’ve changed the strings once, to Zyex silver. I put a center chin rest on for a while but recently went back to the original regular chin rest. I’m on my third shoulder rest, which is working pretty well.